A video from Jackson Hewitt aims to assure consumers that despite overall lower tax refunds, the company will do everything it can to maximize returns. As the first tax refunds come in, people are noticing smaller returns than last year. In some cases, people who got refunds in 2018 now owe a significant amount of money. This is largely due to the tax reform that did away with many deductions and exemptions. The digital-only video is an “In Memoriam” for deductions that filers have to say goodbye to this year. It's a takeoff of the Oscars fixture “In Memoriam,” which ran as usual during Sunday night’s broadcast, paying tribute to the movie industry celebrities and creatives who died in the past year. Consumers will see the video, created by DiMassimo Goldstein, on the financial service company’s social channels and there will also be paid support behind it. 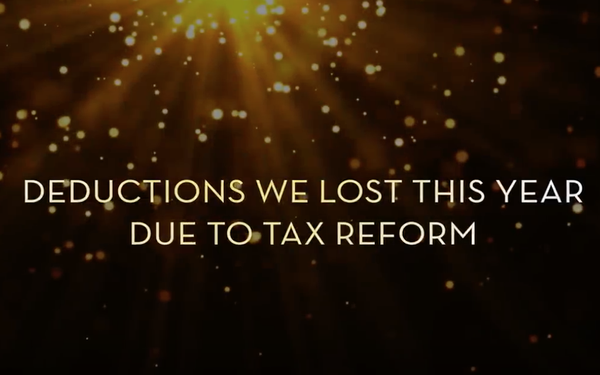 The video aims to show that the company knows all the ins and outs of tax reform. “Jackson Hewitt used a playful idea to create awareness among consumers about the massive tax changes that took place last year,” Jackson Hewitt CMO Euan Campbell tells Marketing Daily. “Many customers are unaware, confused, or even angry about the size of their refunds. It’s our job to make sure they get every credit and deduction available."